We spent part of last week hitting the streets of Barcelona, Spain, to take an inside look at the contemporary designers and architects making the region tick. Spanish (and Catalan) may not be as world-famous as their Italian, Dutch, and French counterparts, but they should be. More on that later! 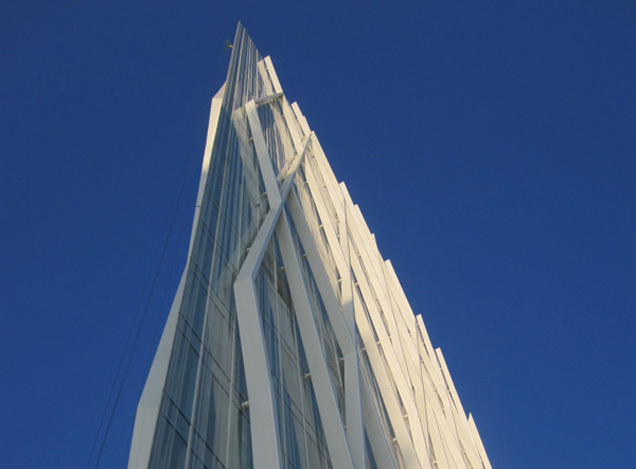 In the meantime, we’ve got images to share from the Torre Telefonica at Zero Diagonal by architect Enric Massip (EMBA), which is set to open this spring. The headquarters of one of Spain’s telecommunications giants is aggressively vertical — especially in contrast to the Herzog & De Meuron Forum Building next door — and much more transparent than one might expect from such a corporate entity. This is a three-story atrium open to the sky above, located on the CEO floor on the 21st story. Telefonica’s new tower at the end of Diagonal in Barcelona (literally: its address is ‘zero’). Enric Massip-Bosch’s is the latest in a series of striking new buildings clustered in an as-yet-unpopulated area carved from an old industrial neighborhood. The tower, 110 meters tall and 24 floors, is aligned with Diagonal, the avenue that cuts through Barcelona from the mountains to the sea. View from the top: The patterned glass curtain wall extends above the roof line, forming one incredible balcony rail. The area at the end of Diagonal, Barcelona’s main thoroughfare, is still fairly isolated but chockablock with capital-A architecture: Herzog & De Meuron, Jean Nouvel, and soon to be Zaha Hadid. Walking from the rear elevator bank to the public entry hall and atrium. Looking out the rear of the building, which faces the Herzog & De Meuron Forum Building and then the Mediterranean. Sections, aerial plan, and floor plans organized by programming, all courtesy of EMBA.